REDWOOD CITY, Calif., May 1, 2017 /PRNewswire/ -- Equinix, Inc. (Nasdaq: EQIX), the global interconnection and data center company, today announced the completion of its acquisition of 29 data centers and their operations from Verizon Communications Inc. (NYSE, Nasdaq: VZ). The U.S. $3.6 billion all cash transaction includes over 1,000 customers, of which over 600 are net new, and approximately three million gross square feet of data center space, accelerating Equinix's ability to help companies extend their IT operations to the digital edge through the interconnection of people, locations, clouds and data. The acquisition of these strategic facilities further broadens Equinix's capabilities by: strengthening interconnection density on the Equinix global platform; accelerating business relationships in the government and energy sectors; and supporting Equinix's enterprise offering. Additionally, it adds three new markets (Bogotá, Culpeper and Houston) and provides additional capacity and the opportunity for expansion in markets where Equinix currently has a presence, including Atlanta, Denver, Miami, New York, São Paulo, Seattle and Silicon Valley. Spread across 15 cities in North and Latin America, the new assets bring Equinix's total global footprint to over 175 International Business Exchange™ (IBX®) data centers across 44 markets and approximately 17 million gross square feet. "As the technological shift to digital is transforming large sections of society and the global economy, companies are re-architecting their IT infrastructure to thrive in this new environment. They are moving from traditional centralized infrastructure to a distributed model that keeps data closer to the customers, partners and employees using it. With this significant expansion of Equinix's globally consistent footprint, our platform is even more valuable to companies that are leveraging this new model of interconnection at the digital edge." "Today is an important milestone in the growth of Equinix, as we significantly expand our operations in the Americas region. The 29 new data centers greatly expand our ability to enable global interconnection within our robust ecosystems, as the economies of North, Central and South America continue to thrive. I am especially thrilled to welcome over 250 new employees and the hundreds of new customers to the Equinix family." Of the over 1,000 customers in the 29 acquired data centers, more than 600 are net new to Equinix, including Fortune 1000 companies and federal and local government entities. Verizon will become a substantially larger customer following the close of the transaction and will remain a key partner of Equinix. 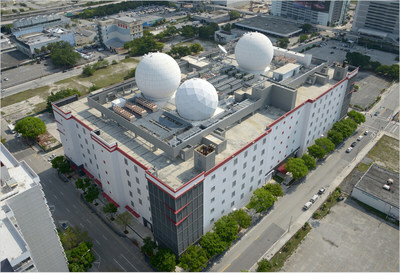 The Miami NAP of the Americas ("NOTA") (MI1) facility is a key interconnection point that will serve as a strategic hub and gateway for Equinix customer deployments servicing Latin America. As the fourth largest Internet exchange point in the U.S., it hosts the termination points of 15 subsea cable systems and more than 120 global networks interconnecting to approximately 150 countries. Combined with the newly acquired data centers in Bogotá and São Paulo, and Equinix's substantial existing presence in Brazil, MI1 will strategically position Equinix in the growing Latin American market. The Culpeper, Virginia facilities (CU1, CU2, CU3 and CU4) represent one of the most secure and technologically sophisticated data center campuses in the eastern U.S. Designed to meet the highest government standards, these IBX data centers accelerate Equinix's relationships in the government sector, strengthening Equinix as a platform of choice for government services and service providers. Approximately 250 Verizon employees, primarily in the operations functions of the 29 acquired data centers, have become Equinix employees effective today. As of Q1 2017, 83% of Equinix's recurring revenue is from customers deployed in multiple metros, many of whom are looking to reach people, clouds and data at the edge by deploying at Equinix IBX data centers. With 29 new data centers and their customers, and the increased interconnection and expansion opportunities this brings, Equinix is strengthening its global market leadership and creating new opportunities to grow business ecosystems around the world. This press release contains forward-looking statements that involve risks and uncertainties. Actual results may differ materially from expectations discussed in such forward-looking statements, including statements related to the acquisition of the 29 data centers and their operations from Verizon and the expected benefits from such acquisition. Factors that might cause such differences include, but are not limited to, unanticipated costs or difficulties relating to the integration of companies or assets we have acquired or will acquire into Equinix, including the Verizon assets; the challenges of acquiring, operating and constructing IBX centers and developing, deploying and delivering Equinix services; a failure to receive significant revenue from customers in recently built out or acquired data centers; failure to complete any financing arrangements contemplated from time to time; competition from existing and new competitors; the ability to generate sufficient cash flow or otherwise obtain funds to repay new or outstanding indebtedness; the loss or decline in business from our key customers; and other risks described from time to time in Equinix's filings with the Securities and Exchange Commission. In particular, see Equinix's recent quarterly and annual reports filed with the Securities and Exchange Commission, copies of which are available upon request from Equinix. Equinix does not assume any obligation to update the forward-looking information contained in this press release.